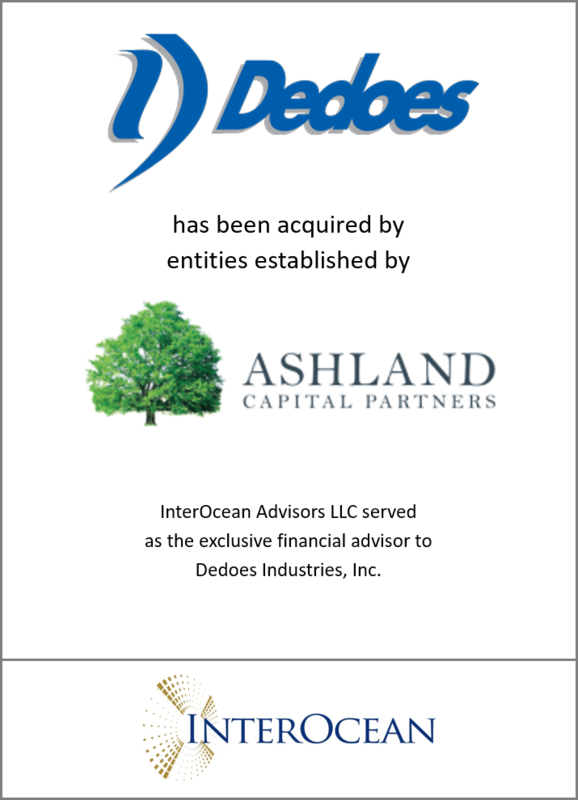 InterOcean Advisors is pleased to announce the successful sale of Dedoes Industries, Inc. (“Dedoes”) to entities established by Ashland Capital Partners, a Chicago-based private investment firm devoted to investing in and growing companies in the middle market. InterOcean acted as the exclusive financial advisor to Dedoes Industries, Inc.
-Nancy Amberger, Chairman of the Board of Dedoes Industries, Inc.
Dedoes is the exclusive U.S. producer of mixing, blending, formulation and storage equipment solutions for the automotive refinish industry and a leader in the worldwide market, serving the leading paint manufacturers and distributors on a global basis. Originally founded in 1941, Dedoes Industries, Inc. is a manufacturer of mixing, blending, formulation and storage solutions for the automotive refinish industry. Products are sold to paint manufacturers, distributors and large refinish centers. The Company’s headquarters and manufacturing facility are located in Walled Lake, Michigan. Ashland Capital is a Chicago-based private investment firm devoted to investing in and growing companies in the lower-middle market. Ashland acquires controlling interests in companies with values ranging from $10 million to $50 million and strengthens these businesses with targeted, strategic guidance. Ashland invests for the long term, partnering with in-place visionary management teams to create lasting business value.